I am very disappointed in this machine. Replaced one that was working just thought I would join in on the "energy efficient" idea. There is not enough water dispensed to clean. My towels smell musky and like mildew and it takes forever to wash a load of clothes. I have even cut down on the amount of laundry I wash at a time. That does not help and the tub smells horrid. I feel so ripped off because I purchased a Bosch on their reputation. I would never advised to anyone on the purchase of this machine. I didn't purchase mine. When we bought our home, the washer and dryer came with it. We were so excited....for a minute. It stinks. It shakes. It broke the pipe in the wall.. I can't wait to replace it. I would never handwash a load of laundry in a bucket of water, yet that's what these water save machines do. Easy on the bleach, more than a capful will have you wearing bleach spotted clothes! These front loaders take so long for a cycle, where is the energy save? I tried putting less clothes, but then the machine doesn't spin properly. I'm ditching mine and going back to the old style. What a shake monster. It shakes so bad I was worried it would start popping grout lines in my shower next store. Exterior walls even shook 2 rooms away, including pictures on the walls, etc.. I have seen other reviews and am convinced this is just an early addition poorly designed washer. I like the idea of the rubber mat being placed under it to help. Next time I will upgrade to something that have strong reviews against the shaking. I absolutley HATE this machine. Mine is 3 years old and has broken down 3 times. First time It took 6 weeks for a Repair person to come out and fix the smelly rubber gasket that basically fell out of the tub..2nd time was a minor fix but took 2 weeks. Now I have been told (after not having my washer for 8 weeks) that there is a National Back Order on the part..We dont know when It will come in! It's crazy! I would NEVER recommend or buy a Bosch again! I add more water to my wash cycles or rinse cycles and I have no smell at all. the machine does allow you to add some water to it. But putting too much water will flush the water out. My machine is only 1 1/2 year old and smells like something died in it. I called Bosch and of course they will do nothing except tell me who in my hometown to pay to come out and fix it. I tried all the little "tricks" they told me and nothing worked. If this is a problem, why should I have to find something to keep the door open, which doesn't work anyway. Does anyone know how much it costs to replace the boot around the door? And do not waste your money on the "washing machine cleaner" that is a bigger joke than Bosch. There is apparently a product that you can use to clean out your machine and cut the smell - I think it's called Affresh??? I had the washer less than a year and noticed my husband work clothes were getting dirtier. It did help get the clothes clean if I manually add 1 to 3 gallons of extra water to the cycle about 15 minutes after I start the washer. I wash all of my towels with hot water, extra smelly soap, bleach, and smelly fabric softner. I also add extra water to each load, and they still smell musty and moldy. I leave the door open when not in use to air it out, but my washer is hardly ever idle. I usually wash at least 1 to 2 loads of laundry every day. I can't even teach my kids how to do laundry because the the machine is so terrible. I am now looking for a different machine that will get my clothes clean without smelling moldy. Any suggestions. I've had no problems with my Nexxt 100 series Machine. We purchased the washer/dryer set at Lowe's with an additional 3 years warranty on top of the manufacturers warranty. We are glad we did because the warranty is up in a couple of weeks and now something is wrong with the computer "brain". Part should be here this week and hopefully will fix the problem. I did notice the smell in the drum, as others mentioned, and learned that front load washers need to "air dry" as it is a sealed machine, unlike a top loader. Based on that info, I would think this is true for all front loader brands. I have had the shaking of the machine as others mentioned, but it was just out of balance and easily corrected. I may or may not purchase another one of these at this point. I'm just disappointed that the computer part is broken and it hasn't been that long, in my opinion. We have 5 children and use cloth diapers. We have been pleased with the washer. I consider the true test of a washer is if it can properly clean cloth diapers and this washer has done as good of a job as my top loader. I do wish we would have bought a larger capacity washer but as it is now the dryer and washer keep up with each other nicely. 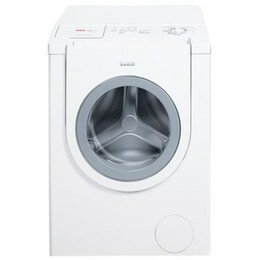 Occationally the washer gets unbalance in the spin cycle and therefor does not fully extract the water from the clothes. The key is to have a variety of size articles in the wash load so as to distrubute the weight. This is my first front loader and my last. It smells awful. Started stinking in less than a year. I always leave my door wide open and clean around the door seal. I paid $800 for this thing and can't stand it. Front loaders are a joke. How can a machine with so little water do a good job of cleaning your clothes? It doesn't. Takes an hour and a half to do a load of clothes. If you like mold and would like to make a career out of washing clothes, then get this washer. My new top-loader is arriving on Tuesday. I have only had this machine for two years and have to junk it. Bosch does not respond when you complain. I bought this washer new in 2006. I am very grateful that I bought an extended warranty with it. With in the last four months, I have had a block weight come off the the back of the machine and go through the tub of the machine. It shakes so hard it knocks thing out of my cabinets mounted on the wall above the washer. Because of the violent knocking and shaking when in the spin cycle, I have had to have the machine bolted down to the floor to keep it from tipping over. I have small children, it is a safety risk. The washer is installed properly and is level. One of the service men told me he thinks there is a problem with the suspension on the machine that came from the factory. The first time I had the machine serviced, the drum, and pump were back ordered, took a month to get the parts in. It is now April 20th. The repair company was going to come today and install a new door, which has come apart because of the bouncing and a new drum for the second time, however once again, parts are back ordered. Sounds like another 2 to 4 weeks before it will get fixed. I have contacted Bosch, not there problem. I was told it is now up to the extended warranty company. Bosch, not willing to help. Customer service rep. David very rude. I will not buy another Bosch product again, or recommend it to anyone. Wish I had kept my reliable top loading Maytag. It could be your laundry soap that is making the clothes smell. I buy a natural laundry soap that works great. As well the manual recommends putting 1 cup of bleach in and running a load without cloths on hot water every couple months. I also never leave my door closed I always stick something in it to keep it open. I really like my machine.